Maybe I fall in love too easily but how can you not? This mix of old wood and iron and wheels and cool joints...it's just all a bit of heaven. The industrial factory cart (now coffee table) featured atop and refurbished by brandMOJO Interiors of Archdale, North Carolina, was used in a furniture factory in the late 1800's. The second has a solid oak frame with the original stencil of its origin- N. Wilkesboro, NC, still intact. The creative minds behind brandMOJO Interiors, husband and wife team Scott and Marisa Kestel, share some insight into their business, explaining- "We are passionate about our work and proud to preserve the tradition of furniture building in America. Our creations are entirely handmade using traditional methods and techniques." All of their materials are either salvaged or reclaimed with care given to ensure the original character of each piece. 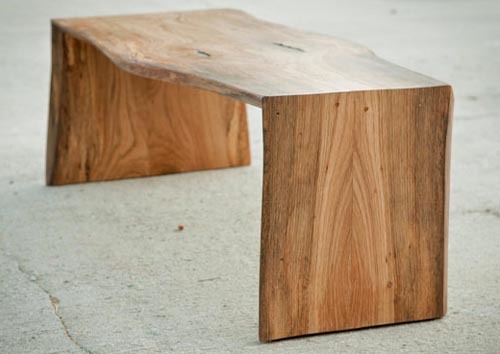 Scott, the craftsman and designer behind brandMOJO Interiors, created this beautiful coffee table using solid American hardwoods - a piece that would make such a strong statement in a room. When I asked Marisa, the CFO of the company, the inspiration behind their work, she responded, "Industrial decay, nature and the work of George Nakashima." 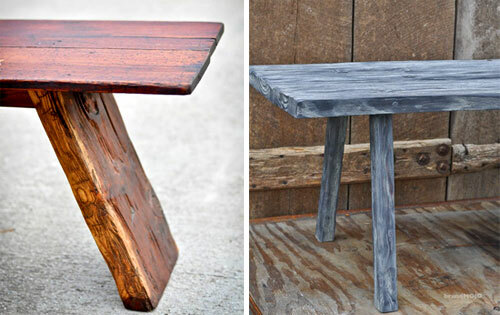 Since each bench or table is reclaimed and reworked, there is no shortage of originality and character. I like how Marisa explains their process, "We let the materials dictate each piece, trying to incorporate craftsmanship while allowing the soul of the woods, objects, etc, to remain prominent."